Bus from Butterworth to Malacca is the most convenient bus service to travel to Malacca. There is no flight service or train service from Butterworth to Malacca, thus bus become the only transportation to travel from Butterworth to Malacca. Malacca is well-known for its historical tourist attraction spots such as Stadthuys, A' Famosa, St. Paul's Church and many more. Cepat Express, Hee Enterprise, Intercity Coach and KKKL Express are few bus service providers supplying bus from Butterworth to Malacca. Cepat Express and KKKL Express have more daily departures from Butterworth to Malacca as compared with the other bus operators. The earliest bus goes at 10:00am while the last bus leave at 11:30pm. KKKL Express and Hee Enterprise are operating the route with VIP coach while Intercity deploys luxury High Deck VIP coach and Cepat Express deploys standard 4-seat-in-row coach. The travelling time from Butterworth to Malacca requires about 7 hours depending on the road traffic condition. At least one stopover will be given during the journey. During the stopover, passengers can go for washroom or buy some snacks. The bus ticket price from Butterworth to Malacca costs in a range from RM 48.00 to RM 55.00 depending on your choice of bus operator. Cepat Express offers child fare at RM 36.00. The coach picks up all the passengers at Penang Sentral Bus Terminal. Upon arriving at Malacca, the bus driver will drop off all the passengers at Melaka Sentral Bus Terminal. From Melaka Sentral Bus Terminal, passengers can take local bus or taxi to their next destination. 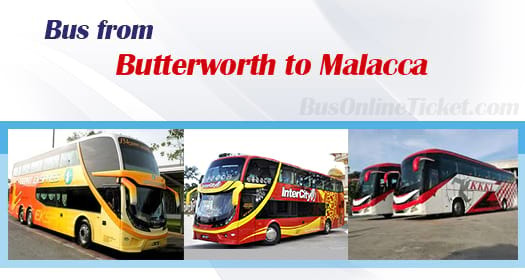 Hurry up and book your bus ticket from Butterworth to Malacca at BusOnlineTicket.com. We accept various type of payment method such as credit card, internet banking, Paypal, Alipay and etc. Making your bus ticket booking in advance with BusOnlineTicket.com can secure your seat before your trip.